The Yukon 800 Mile Marathon, the grandfather of Alaska’s contemporary endurance races dating back 47 years, is a 2-day high speed riverboat race. Run on the Tanana and Yukon Rivers, traveling through hundreds of miles of vast Alaskan wilderness. It is billed as the longest, roughest and toughest speed boat race in the world. Competitors live in Fairbanks and communities along the rivers, where they build the low-slung 24 foot long boats from scratch. These race boats are powered with 50 horsepower regulation engines that can reach speeds in excess of 70 miles per hour. The Yukon 800 begins in Fairbanks in late June, around the time of summer solstice, and finishes after 800 grueling miles the next day back in Fairbanks. Unpredictable weather such as high winds, rain and hail, blowing sand from river sandbars, smoke from nearby forest fires and fog can limit visibility. Plus, large trees, logs and other drift wash from the riverbanks and ride the current down the rivers. All can be a determining factor in the most meticulous plans of even the most seasoned Captain and crew. According to historians, the Yukon 800 evolved from races held along the Nenana River and on a gravel pit outside of Fairbanks in the mid 1950s. Then came talk of a larger, grandeur form of competition. During a bar-room conversation in 1959, an idea emerged for a riverboat race that would decide who the best riverboat racers were. The race began at Circle City on the Yukon River and was dubbed the Arctic Circle Marathon because its course traveled above the Arctic Circle for 20-30 miles near the village of Fort Yukon. The inaugural race in late May of 1960 started with 21 metal riverboats 24 to 30 foot long and powered by 40 horsepower engines and finished with 18 boats. The winner, Ray Kasola and crew ran the course from Circle City to Fairbanks in 26 hours, 26 minutes and 55 seconds. The desire to become “King of the River” fueled many competitors to design faster and lighter boats, looking to get more power and speed out of their engines. Today’s boats are specifically designed from Sitka Spruce for the framework and 1/8” to 1/4” plywood for the hull. In 1964 the Fairbanks Outboard Association decided to move the start and finish of the race to Fairbanks to increase spectator and sponsor participation. The race would run to the village of Ruby on the Yukon River as the half way point and return, making the total race 700 miles round trip. In 1972, the FOA extended the race course to Galena, increasing the race to 800 miles round trip. The racers began spending the night in Galena, returning to Fairbanks the next day. This 800 mile marathon race known as “The Survival of the Fittest”, traverses 800 miles of torturous, treacherous, glacier-fed rivers dotted with sandbars, gravel bars and floating debris. It starts in Fairbanks on the Chena River and runs to its confluence with the Tanana River. 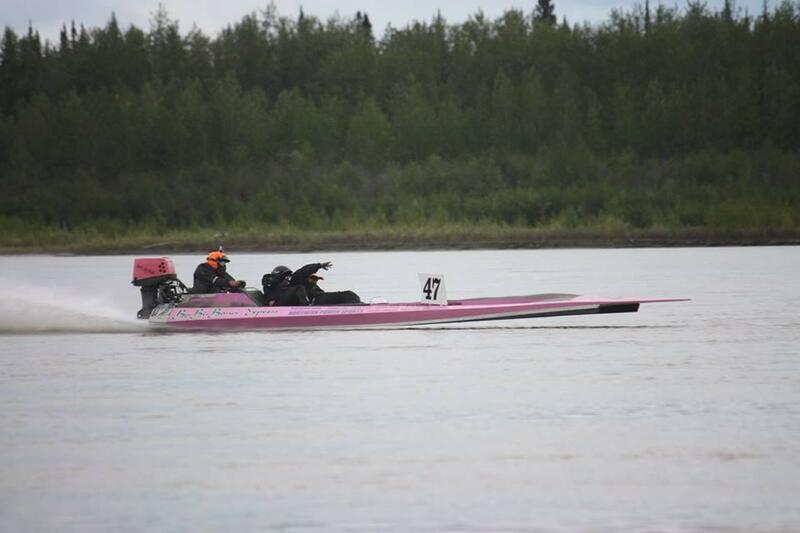 The racers follow the Tanana River past the villages of Nenana, Old Minto, Manley Hot Springs, Tanana and Ruby. FOA charters a plane that follows the course, carrying race officials, media and family. The next morning the three person crew, after having survived the beating to the body and doing repairs to the boat, prepare to leave Galena. The only time the FOA allows a mass start is when the Yukon 800 leaves Galena. The racers eagerly eye the river and each other, calculating wind, water, mechanics and tactics. The finish at Chena Pump Campgrounds is a cause for holiday. The family, friends and media gather to see the first “rooster tail” coming around the corner. Copyright © 2004 Fairbanks Outboard Association . All Rights Reserved.